We have been looking back at some of our discussions regarding the proposed EU Regulation and found some interesting communications/questions and answers. We leave you to make your mind up on these, some of which go back to early 2009. Right To Ride – Response to DG Enterprise Part 2 – February 2010 Click Here pdf 275kb. If anti-tampering measures are introduced for the whole power train, does that mean that motorcyclists cannot (even if carried out by a mechanic) make modifications by using type approved exhaust systems? 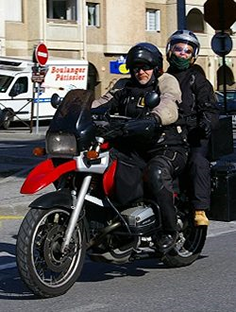 Of course type approved exhaust systems will remain an alternative for motorcyclists to fit on their vehicles, as long as the retrofit exhaust systems fulfil the type approval criteria in terms of noise levels, pollutant emissions and if the general safety level is maintained (sufficient protection against burning, etc). It should be prevented that type approved exhaust systems with integrated after-treatment technology are replaced by illegal down pipes with modified bricks (drilled holes to decrease back pressure) with a reduced pollutant emission reduction capability or even worse with a completely removed catalyst. To be able to identify if an alternative exhaust system is type approved supports the enforcement authorities identification between a potentially compliant and non-compliant system, but it should only be considered as one of a number of instruments which can help to ensure that emission pollutant levels remain within the acceptable boundaries of type approval limits. Similar statements are applicable for noise. Type approval of retrofit components and systems should help to guarantee that the obtained Whole Vehicle Type Approval by the manufacturer does not become partially or entirely obsolete. On emmissions – It appears that the authors are stating that effectively the percentage of manipulated vehicles refers only to fault code 802 (0.824%) and that the evidence of manipulation for this fault is 50%, is this correct? If we extrapolate these findings throughout Europe, we can suggest that 96.9% of PTWs do not have emissions problems beyond legal requirements, however if we use the criteria of the TUV study as a model for anti-tampering, then it appears that 99.2% of the vehicles examined do not present any evidence of tampering. We do not want to speculate on the phenomenon of tampered vehicles and are reluctant to extrapolate these types of data, especially as they were collected 10 years ago. We acknowledge that the data is old and that technology has evolved fast over the last decade. It does not mean that the study results are completely obsolete, but there are reasons to conduct an additional study sometime soon. However, not having data available should not prevent us from applying common sense in the development of policy options. We are looking forward to closely cooperate with riders associations like Right to Ride and FEMA, and also with the industry in order to develop a concept, which is sensible, effective and coherent. If motorcyclists can change the exhaust system when they have RW (Road Road Worthiness) testing (ref. TUV report), why does the MCWG (Motor Cycle Working Group) believe that the proposed anti-tampering measures would make any difference? We appreciate your suggestion to differentiate between legal and illegal vehicle modifications (tampering). The spirit of possible anti-tampering measures must be to discourage illegal modifications as much as possible, but to accommodate legal modifications. We hope that you appreciate that this balance is difficult to strike between these antagonists and that we have used the Impact Assessment to analyse pros and cons of the different assessed policy options. The Impact Assessment report will be published after the proposal is adopted by the Commission, providing the opportunity to track the reasons why we have selected policy options as the preferred ones. Also for example, tyres, if a motorcyclist finds a brand that is not used by the OEM, does that imply that the motorcycle is not as safe and if so why? The same principles apply as indicated under item 2. Again it is not about the brand or the supplier, as the Commission is in favour of fair competition on the internal market. It is in the interest of the rider that an alternative fitted tyre offers an equivalent or higher levels of safety than the tyre type which the manufacturer used to type approve the vehicle. Therefore it is up to the tyre manufacturer, who offers the alternative product, to prove that the alternative tyre type offers the same level of safety and environmental performance than the original tyre as type approved by the OEM. The Commission intends to refer as much as possible to international standards, in this case to UN ECE Regulation 75, which could replace chapter 1 of the multi-directive 97/24/EC for components; the installation requirements of the separate directive may need to be retained. 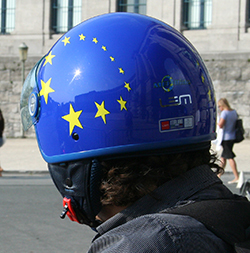 A question in the European Commissions public consultation (Feb 2009) – replied to by the DfT (Department for Transport) Do you think that the additional measures proposed by the TüV study and the one proposed in the Motorcycle working group mentioned above? Why? We are sceptical of the benefit of current anti-tampering provisions and would expect to see a cost benefit assessment for any additional measures. We can see the logic of anti-tampering requirements on vehicles where licencing restrictions exist and so extending anti-tampering requirements to motorcycles limited to 25kW may be justified. However we see no justification for extension to higher performance machines which are not associated with driver licensing restrictions. We would like to point out that the total sum of mopeds analysed in the study for all countries in the MAIDS report, was 51 with a control group of 70 (we could elaborate on issues of reliability and validity, but this would detract from the discussion at hand). As with the TUV study, we would also suggest that any extrapolation of the findings of the MAIDS study as an indication of a European wide problem is questionable. In the event this refers only to mopeds, which already have specific anti-tampering measures applied. 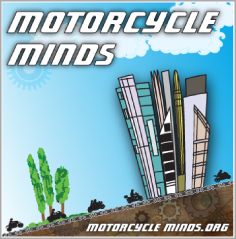 Number 16 of the Main Findings states: “Only Modified conventional street motorcycles were found to be “over represented” in the accident data. There was no evidence of an increased risk associated with riding any other PTW style”. There were only 6 L1 and 19 L3 modified conventional street motorcycles analysed. Once again – to extrapolate data from 25 motorcycles as the sum of a European wide problem, should be in our view be best described as “wing and a prayer” evidence. What concerned us was that in number 17 of the main findings the authors claim “There were no cases found by the teams in which an accident was caused by PTW design or manufacture”. Thus number 16 of the main findings appears to contradict the rest of the main finding Number 17 which states: “Technical machine problems feature in less than 1% of accidents and those were mainly related to tyres”, because if you cross reference this with claims about the significance of modified bikes, it would appear that modifications do not cause any “technical problems”. The reason for our (Right To Ride) additional document is to explain that from what we have been able to find, there is no relevant evidence that tampering (in the illegal sense) is a widespread problem and until such time as evidence can be found otherwise, hearsay or inconclusive research, should not be a reason to introduce legislation.